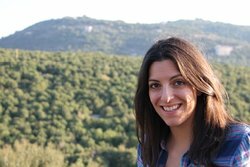 Bittersweet Enchantment: Book Blitz: Corner of Ocean and Bay by Gina Azzi | Top Ten Guest Post + Excerpt + Giveaways! 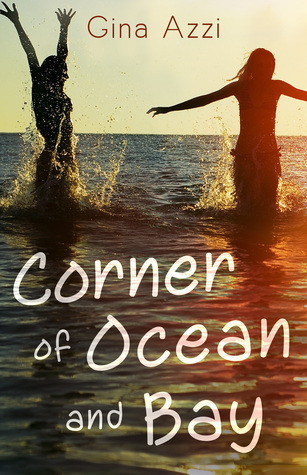 Book Blitz: Corner of Ocean and Bay by Gina Azzi | Top Ten Guest Post + Excerpt + Giveaways! Strong hands close on my hips from behind and I immediately recognize Z’s touch, his smell envelops me as he pulls closer. The hard muscles of his thighs alleviate the pressure on my legs as his forearms close around my middle, holding me up, pressing me into him. His chin dips down, nestling in the curve of my neck. He presses a soft kiss to the top of my shoulder. I nod, barely, before his lips gently press over mine. Z kisses me slowly, sweetly, reverently. He pulls back slightly and looks into my eyes, shaking his head imperceptibly. His hands work their way up my shirt, gripping the sides of my ribcage and he jerks me closer, slanting his head; his mouth crashes over mine, and I’m pulled under like a riptide. My feet arch and I rise up on my tippy toes. My hands grasp the collar of his polo shirt, pulling his face closer. I brush my lips against his gently. He doesn’t respond. I try again, flicking my tongue out to catch his bottom lip. My hands slide to the back of his neck, brushing against the edge of his collar, where his hair curls over slightly. I pour my soul into the kiss: my beating heart, my frustration of sneaking around, my anger over the traitor tears, my admiration for him, my everything. Just as I start to pull away, his arms wrap around me, grasping me closer. His left hand clasps my head, just behind my ear. He angles his mouth over mine and kisses me harder, deeper. And I forget to breathe. It’s OK not to have all the answers. They’ll come to you in time. Your best ideas come from the most unlikely places – and in very surprising moments. Honest friends are more important than friends who don’t want to hurt your feelings. Have several people read your book – before you send it to the editor. The cover is incredibly important. Yes, people do judge a book by its cover – it’s true! You don’t have to accept every suggestion someone offers on how to improve your novel – the ultimate decision to accept or reject a change is yours. But you should always listen first. Be open and receptive to criticism – you’re characters may grow a bit more, your ideas may develop, etc. – if you are open to understanding the perspectives of others. Some days, the writing will not come. And it’s ok. (Other days, it will flow. These days are awesome!). Your characters are not you. Or your friends. Allow them to form their own identities. Have fun – and enjoy the process! It’s amazing how much you will learn and grow and develop. Gina loves meeting new people and would love to hear from you! There are two giveaways you can enter below. The first one is for my blog readers only in which you can win an ecopy of the book and the second one is a tour-wide giveaway where you can win a $50 Amazon Giftcard. Both are open internationally! I do love the beach during summer.